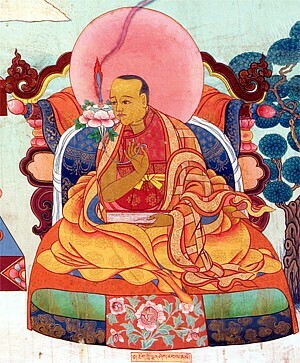 Ngok Loden Sherab (Tib. རྔོག་བློ་ལྡན་ཤེས་རབ་, Wyl. rngog blo ldan shes rab) (1059-1109) — one of the most famous translators in Tibetan history. He was the nephew of Ngok Lekpé Sherab. He revised the translation of the Bodhicharyavatara and composed a commentary on it. He also translated Maitreya’s Uttaratantra Shastra and Asanga’s commentary with the pandita Sajjana, as well as Vasubandhu’s commentary on the Dharmadharmata-vibhanga. With Bhavyaraja, he translated Prajnakaragupta’s commentary on Dharmakirti’s Pramanavarttika. His many other translations and revisions include the Abhisamayalankara and commentaries by Vimuktasena and Prajñakaramati; Dignaga’s Prajnaparamita-samgraha karika with Triratnadasa’s commentary; and Dharmakirti’s treatises, Pramanavinishchaya and Nyayabindu. This page was last edited on 6 February 2017, at 05:47.